The Little Mermaid coloring pages immediate brought me back to seeing The Little Mermaid in the theaters for the first time when I was a kid. Now, they are having the 30th Anniversary of the film and I remember when it came out! How crazy is that? In honor of its 30th anniversary, two-time Academy Award®-winner (Best Original Score and Best Original Song “Under the Sea,” 1989)“The Little Mermaid,”dives into the highly celebrated Walt Disney Signature Collection with all-new bonus features and a sing-along mode. The magical, musical tale of mermaid princess Ariel—along with loveable sidekicks Sebastian and Flounder, and the love-to-hate sea witch Ursula—is shore to make a splash with all generations when it comes home for the first time Digitally in HD, 4K Ultra HD and Movies Anywhere on Feb. 12, and on 4K Ultra HD and Blu-ray™on Feb. 26. It was an amazing treat for me to meet the great Alan Menken a few years ago during an interview for the live action Beauty and the Beast. He was so nice and it was amazing getting to meet someone who shaped the score to my childhood. The latest installment of “Stories from Walt’s Office” compares Walt and Ariel’s love of collecting treasures. Viewers will also receive an inside look at the “The Little Mermaid” cast in their original recording sessions, explore hidden treasures and fun facts from the film, and enjoy a special performance of “Part of Your World” by a cappella singing sensation D Capella. Plus, fans will have access to hours of additional classic bonus features! Use the coloring pages for crafts at your The Little Mermaid themed birthday party. Check out my daughter’s Mermaid Birthday Party here. Add Coloring Sheets to a gift bag for your next Mermaid Birthday Party. Turn your mermaid coloring pages into wrapping paper. Give the coloring sheets to your child’s teacher to have the kids color in class. 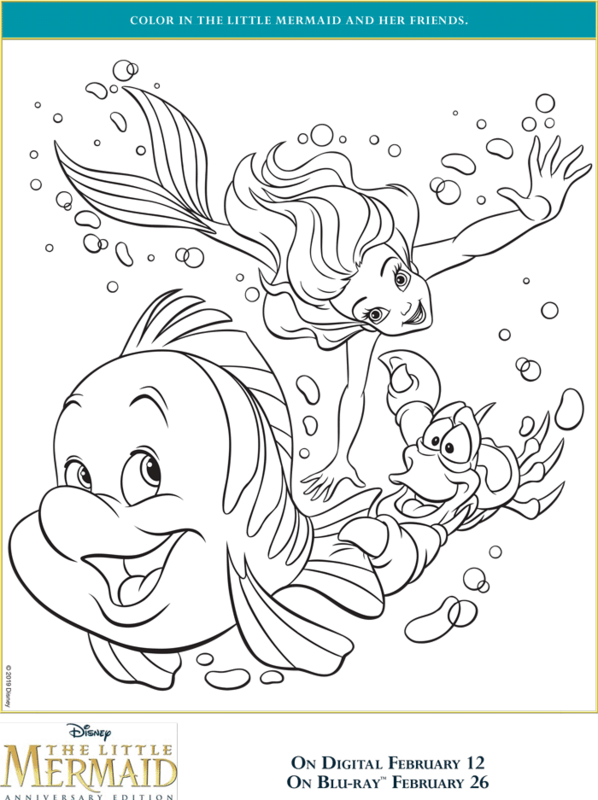 Have mermaid coloring pages available for every day coloring for kids.